Legendario – Approved PRE Partbred Breeding Stallion. ai) Stallions should be tested for the following diseases before commencing covering mares; CEM, EVA, Klebsiella, and Pseudomonas. The test certificate should show a negative result for each disease. Mare owners may ask to see a copy of the Stallion’s certificates. aii) It is strongly recommended that stallions who are covering naturally should only cover mares which also have a current test certificate showing them negative for these diseases. Where this policy is followed the stallion need not be re-tested annually. 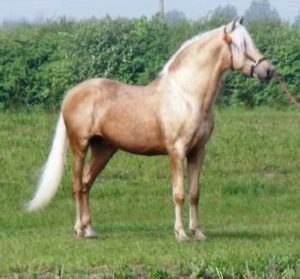 bi) Stallion Owners must always inspect the visiting mare’s Passport, whatever the breed of mare, and determine to their own satisfaction that the visiting mare is indeed the mare named in the Passport. ci) It is the responsibility of the Stallion Owner to apply for a BOOK of BAPSH Ltd Covering Certificate at the start of the breeding season, and to complete a Certificate as soon as the mare is confirmed in foal. 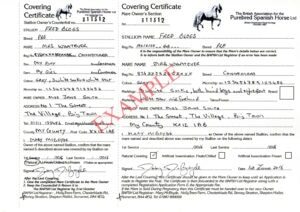 Each Covering Certificate must be completed accurately by the stallion owner and all the details requested, concerning the mare, should be entered if at all possible. The mare owner should be given the large part of the certificate to keep until the foal is registered in the following year. The small part of the certificate should be forwarded to the Registrar before DECEMBER 1st of the year of Covering. NOTE: STALLIONS NOT registered with BAPSH Ltd cannot be issued with official Covering Certificates, nor Foal Registration documents. This may result in pedigree PRE Partbred foals that can never be registered with their full parentage recognised, thus losing the majority of their status and value. Once a horse is outside the pedigree Studbooks it can be difficult and expensive to regain entry to the pedigree Studbooks. Any BAPSH Ltd Register II Partbred Stallion with good conformation and temperament, who is sound, healthy and free from inheritable defects will be considered for Breeding Approval no matter what bloodline mixture he is composed from. 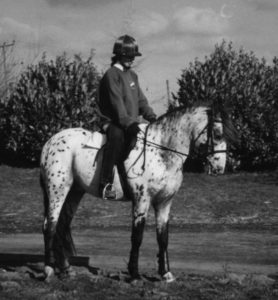 To date our largest Approved Partbred Stallion is the enormous Silversons Ulysses (Spanish Norman) who is at stud in Germany, and the smallest is the spotted pony Mill Dominguero. Left: Silversons Ulysses at 4yrs. 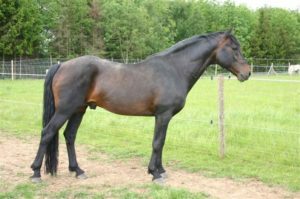 Sire: Cañaveral II-PRE, dam: Obole du Bocage-Percheron. Bred by Clair Lilliman. Take FOUR Good Photos of your stallion to show him at his best, as follows:- One showing his Rightside, One showing his Leftside, One from directly behind him showing hindquarters, and One from directly in front to show his head and front. Then Download and Print the two Application for Breeding Approval forms below. Part One is for the owner to complete and Part Two is completed by an Equine Vet during a thorough examination of your Stallion. Send your Photos, the completed Application forms, your Stallion’s Passport, and the Application Fee (£50.00) to the BAPSH Ltd Registry Office. If your Stallion is Approved for Breeding his Passport will be updated and certified, and he will be eligible to appear on our Stallions At Stud Listing, to have Covering Certificates issued for him, and to contribute to the future of Spanish Horses in the UK. Espiritu – our most senior Approved Partbred Stallion. Born in 1993. Bred & Owned by Karen Collison of Aztec Stud. 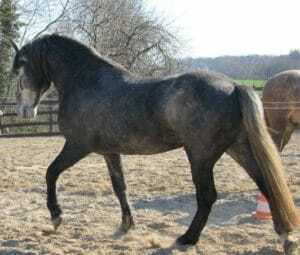 Sire: Churumbel II – PRE, dam: Sienna – TB x Andalusian.